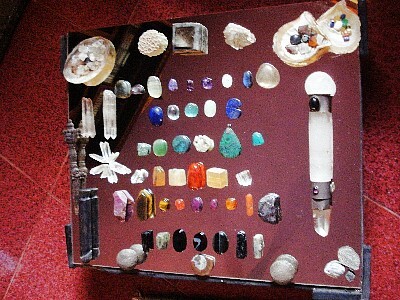 Crystals, gems, minerals and metals are wonderful tools for healing, protection and transformation. They have been used by ancient cultures all over the world to heal and empower individuals. Alchemists and Mystics have used crystals for themselves, others and the environment, nature and animals. They burnt crystals to a powder and mixed that with metals, prepared healing liquids, creams and powders which cured all kinds of ailments. Rulers wore Jewelry made of crystals and metals not only as decoration and to show their power and the richness of their kingdom but also for their health, protection and own empowerment. They also drank out of different metal cups like gold, silver, copper and brass for their different healing qualities. These qualities were transmitted into the liquid. This tradition is still practiced. For example, in India drinking cups are still made of valuable metals and in Europe new born babies often receive a spoon and mug made from silver to use from small onwards. Every crystal, gem, mineral and metal has different healing properties and characteristics. They deepen and support any healing process. They are entities (alive bodies) and can visually respond even while being used. For example they can crack while being used on somebody as they pull out heat or rebalance energy blockages. Afterwards, while resting they can heal themselves so that they can be used again. It also happens with mountain crystals that they grow small crystals “out of the blue” after being cut off. I learnt about working with crystals and their powers in India 25 years ago and have been passing on this ancient wisdom to my students so they can use crystals, gems, minerals and metals to heal and protect themselves and others. I use crystals, gems, minerals and metals in my Whole-istic Healing Sessions depending on the individuals’ needs and problems. 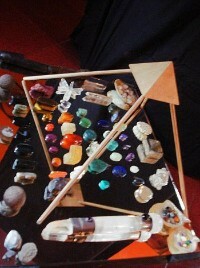 I also give 3 day courses in which I teach about crystals, gems, minerals and metals. In my crystal course we first learns how to select one’s personal 7 charka stones, birth stones, healing stones, luck and empowering stones. We learn how to cleanse them (which has to be done after each use) and how to recharge and give affirmations into the stones. In each crystal course we learn about the crystal’s different qualities and healing powers. For example which crystals strengthen bones, blood, organs and the senses, and which crystals work on mental and psychological distractions. We learn how to cleanse and prepare crystals according to the moon’s cycles in different substances such as sterilized water, alcohol or earth through visualization. We also learn how to prepare ayurvedic crystal waters for different ailments. Some of them can be made immediately for direct use and others need longer time to prepare. Drops of these preparations are taken daily with water and we learn how to use a Pendulum to determine the amounts and frequency which the body needs. These preparations (crystal waters) are very powerful and good to use in conjunction with any other treatment. Some of my students and me work with crystal/metal therapy effectively for many years. 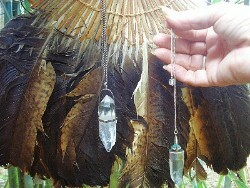 I teach a 3 day crystal course about using crystals to protect and heal oneself after Reiki I and 21days of cleansing. I only teach about using crystals to protect and heal others after Reiki II initiations as one should only “work” on others after being able to heal oneself. It protects the healer and helps avoiding the ego. One should not play at being a “world savior”, before one is able to “save” oneself.